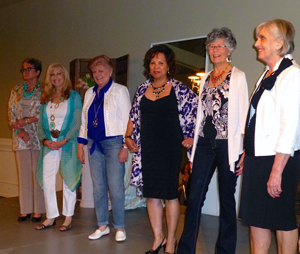 Mill Creek Women’s Club members show the latest fashions from Chico’s and White House Black Market. Photo credit: Lesley Van Winkle. “DO SOMETHING EXTRAORDINARY. YOUR COMMUNITY IS WAITING.” The New York Times best-selling author of “WILD,” Cheryl Strayed, will be the warmly welcomed keynote speaker at “The Inspire Luncheon” on May 1, 2014, at the Edward D. Hansen Conference Center in Everett. (We have heard her fascinating true story is being produced into a Major Motion Picture). This very special annual fundraising event is hosted by the YWCA. To support their mission of empowering women of all ages, races, and faiths, the YWCA provides critical services to promote self-sufficiency, reduce violence, and eliminate racism. Mill Creek Women’s Club contributes to that endeavor through auctions, raffles, donations, and volunteering. A truly inspiring and extraordinary luncheon! Our Women’s Club will be recognized and honored by a private meeting with Cheryl Strayed and Northwest celebrity and YWCA supporter, Jean Enersen, King 5 News Anchor. What an exciting opportunity! All Mill Creek Women’s Club members are encouraged to attend! We have FUN together! On a rainy Sunday afternoon in February, many members immersed themselves into “Steel Magnolias,” played by women and about women’s friendships. We listened attentively to witty, humorous, relatable local author, Amy Hatvany at our February Luncheon. On March 26th meet and enjoy lunch with friends at Tulalip Outlet Mall/Casino. There will be a no-host lunch at The Ram restaurant followed by shopping to your heart’s content at the outlet mall or “winning” some money at the casino. Nine (mostly new) members gracefully modeled the latest looks from Chico’s, White House Black Market, and Soma at our March Fashion Show. So much is coming up this Spring! John Lovick will share Home Safety Tips and we will host a Vendor’s Trade Show at our April 16 Luncheon. Socials to anticipate are Culinary Events Northwest and Wine Pairing at Lynnwood’s Albert Lee on May 7. An enchanting trunkshow social event at Belle Provence is in the works. More information to be revealed soon! Spring Cleaning? YWCA’s Working Wardrobe is always in need of new or gently used seasonal, stylish, work-appropriate clothing and accessories. Please contact Philanthropy Chair, Kathy Vail at 425 967-3640 for donations. My, goodness! We are still growing at over 160 joyful, generous, friendly and fun members! Please consider joining us if you live in the Greater Mill Creek Area and are committed to enhancing our community through friendship and philanthropy. Go to: www.millcreekwomensclub.com or call Membership Chairs: Sue Ramsey at 425 385-2016 or Judy O’Loughlin at 425 338-0990. We meet September through May at the absolutely gorgeous Mill Creek Country Club. There is a charge for the Luncheon/General Membership Meetings. Annual dues are collected at the time of new membership or renewal. We’d LOVE to meet you!